Photos courtesy Albert Johnson Jr., ASGH member. While the skies in Middletown are considerably light polluted, some prominent deep sky objects are still visible. 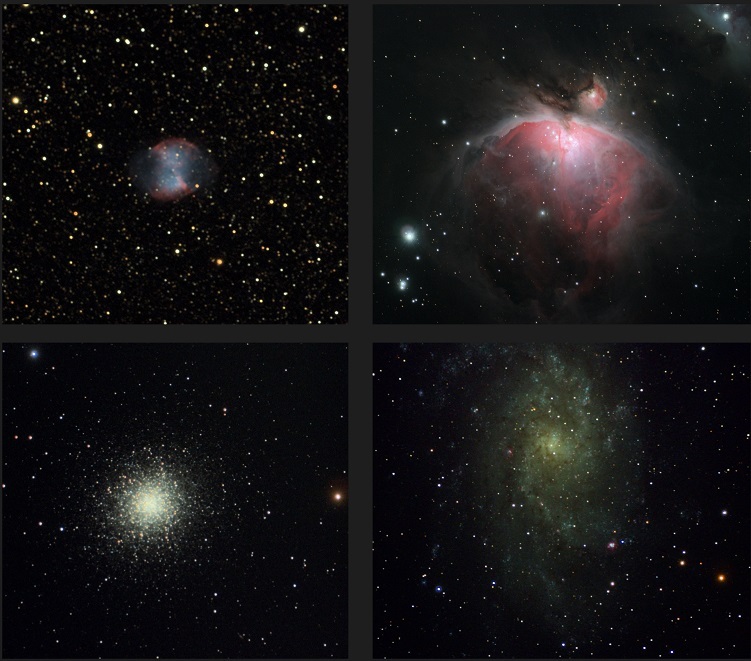 The examples shown above are: M27 (planetary nebula), M42 (diffuse nebula and star forming region), and M13 (globular cluster). The last image is of M33 (galaxy), this object could be difficult but maybe not impossible to see from Van Vleck because it has a low surface brightness spread out over a large area. However, nearby M31 in Andromeda is easily visible. Not as much detail and color will be visible as in these photos, but viewing them through a telescope is always a worthwhile experience. During any season, depending on the sky conditions, a few deep-sky objects should be visible.